When looking at a world map Hong Kong, you can see what is meant in a saying, known to all Hong Kong people. "Hong Kong is just as small as a sesame seed." It is located in the southeastern part of Asia, the delta area of the Zhujiang River of China. It is relatively close to the Equator. That's why Hong Kong has a subtropical climate. It is also because of this weather. You can literally do anything in Hong Kong without worrying how the weather is going to affect your plan, entertainment, touring attractions, shopping and/or other activities. Once you have a Hong Kong vacation or work over there, you want to move and live there. Believe me, it happened. There were so many people I knew just did that. They gave up their Korean, British, Canadian or American citizenship for this reason. There are many foreign labors, such as Filipinos, Thai, Vietnamese and so forth thinking this city is a "paradise". Some people loves this city so much that they would think of many different ways to try to stay there forever. You may think that I exaggerate it too much. But it is true. Interestingly, archaeologists believe that human activities in Hong Kong started over 30,000 years ago. Tools used in the old stone age was found in Sai Kung. Lei Cheng Uk Han Tomb is another proof. By the early of 19th century, this former fishing village became a strategic port of the British trade with China . Just by looking at the world map Hong Kong, it appears to be an insignificant city. Who could ever think that Hong Kong would become the gateway to China and the main hub of Asia? It has been back to China since 1997. Obviously, China has become a world rising power. But it still believes that Hong Kong is the proof of success and the gateway to the world. Many of my friends think that Hong Kong is China. In some ways, it is not. It is called HKSAR (Hong Kong Special Administrative Region). It has its own legislative and judicial systems which are still very similar to those during the British colonial era. 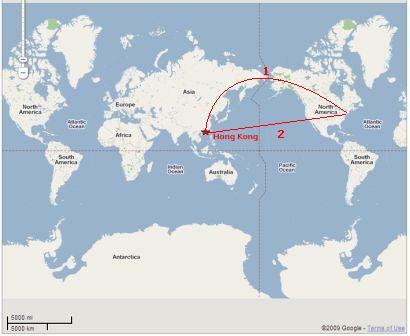 Which is the correct route that the plane flies from East Coast, U.S. to Hong Kong? Saw the picture above? Which route is the shortest way to get to Hong Kong from the east coast of the United States? Well, it's very obvious, right? Route no. 2..... Actually, it's route no. 1. I got to share this funny story with you. After Perry, my hubby (my boyfriend then), visited me, he has been telling people that going through the Arctic Circle is the shortest and the quickest way to go to Hong Kong. Silly me....after living in Hong Kong for so many years, I still thought that going flying straight across the Equator should be the shortest route. For at least 3 years after marrying him, I still didn't believe his "theory". I am sure you are laughing by now. Until one day, we were looking at the map on the globe. Perry took out a piece of string to prove to me that his "theory" is correct. Haha....Bingo....He has been right. I totally forgot that the globe is round. I have been looking at the world map Hong Kong on a print-out hanging on the wall. The worst of all....he compared the measurement of those 2 routes. The way going through the Equator is about double. Men....I am telling you that he will never let me forget this for the rest of my life. So, if you want to teach your kid(s) about the geography of Hong Kong, remember my story. For more information, check out the Fun facts about Hong Kong page. How far from where you are to Hong Kong? The following is the list of some major cities around the world showing you how far they are from Hong Kong. It shows you the distance in km, miles and hours of flight . World map Hong Kong only gives you a very brief idea of this tiny, but significant world top financial city, a peek in relation to the rest of the world. 1) Fun Facts About Hong Kong - This is an eye-wide opener. 2) Map of Hong Kong - The map changes dramatically in the last 100 years. How? Why? 3) Hong Kong Road Map - The main infrastructure built by the Hong Kong government connecting 235 islands together. 4) Hong Kong Street Map - Stepping into the heart of the city and see it looks like in front of your eyes. And because of the continuous reclamation of the land, the map is changing continuously. You would not believe how much it changed 3 years ago. So, where do you go to get the latest map for your next Hong Kong vacation? 5) Hong Kong Map - Precisely at what location to do what? Shopping, dining, touring, entertainment, nightlife and more.